As India is slated to get into a new tax regime by implementing Goods & Services Tax (GST) on July 1, Kashmir is already converted into a battle field. While traders and unionist opposition parties were already hawkish, the new entrants to the ring are the separatists. The new taxation system, they believe will “harm the business community” as “few state ministers are in league with authorities in Nagpur” and were “lured” to implement GST. One of world’s efficient tax systems, GST is aimed at creating a single market that has clear transparent systems in place to reduce frequent government interventions and to encourage self-assessment. It is expected to reduce costs by doing away with multiple taxes at various levels and help tax money move from manufacturing spots to consumption area. In Kashmir, the crisis is twofold. Firstly, people have issues in migrating from loosely designed national VAT system to GST. Secondly, there are apprehensions that with GST regime, the taxation system emerging as a central monopoly, J&K could lose on its exclusivity to tax its subjects, flexibility to modify tariffs and systems and to share the collections with the central government set-up. J&K is the only state in India that has its own constitution offering it rights to legislate on taxation issues. This is what is being referred as autonomy in the ravaging GST narrative. In absence of an alternative trading link (barring the small twin windows for barter with PaK), J&K is literally integrated with mainland India market. Entire requirements are imported from it and everything produced or manufactured in J&K is exported to the same market. Twin taxation systems dissociated from each other will entail costs to business and to public finance system. Trading processes will be subjected to twin taxation systems making everything costly in J&K, a cost that ultimately the consumer shall have to bear. Traders will have to pay more for managing twin systems and it could create a situation that J&K may not get buyers or sellers. The Input Tax Credit (ITC) that shall otherwise become available to the end consumer will get blocked at Madhavpur, the first town outside J&K. But the efficiency of GST has roots in its tedious complicacy of filing almost 37 returns in 365 days, excluding exemption threshold categories. Shifting an item from one rate band to another, in GSTs four rate bands, or changing tariff, would require a consensus in the GST Council. Since centre and the state governments will share the collections, there are apprehensions that the sleuths from central government may push the state interface to back seat. States, by the way, can have administrative control over 90% and the centre over 10% of the cases with annual turnover of less than Rs 1.5 crore and beyond this they will have 50:50 control. But who administers whom, GSTN, a computer system that is a PPP initiative, will decide. A single tariff structure for diverse cultures may not fit the basket as well: a Kashmiri shawl can cost more than a million rupees and taxing it heavily will mean a massacre. Even as only five percent of the returns – also generated randomly by GSTN – will be audited, the appellant system is another source of dread in Srinagar’s business street. The question being loudly asked is: how will industry function with its concessions being consumed by GST? The fact is that centre is no stranger in tax collection in J&K. It has been collecting central excise since 1954 and central sales tax since 1958. However, it was shocking that state government asked traders to migrate their accounts at a time when it was busy negotiating a process and in clear absence of a supporting law in the state. Another shock was that more than 24 percent of traders registered with Commercial Taxes Department, mostly from Jammu, have already migrated their accounts to GSTN! NC’s six time finance minister Abdul Rahim Rather has been part of the GST Empowered Committee and his successor Dr Haseeb Drabu a vocal voice in the GST Council. Both know there are no escape routes from GST. Unlike traders, their problems lay somewhere else. How to adopt GST without actually losing the fig leaf of autonomy that J&K symbolically retains. With or without them, GST will extend to J&K, they are sure of it. Safeguards are their only concern. Article 370 has nothing to do with GST. It, however, is the only vehicle available to both the governments in Srinagar and Delhi to extend GST. Since 1950, it has been the Clause (1) of the Article 370 that the President of India has invoked to make an order “in consultation with the J&K Government”. From the days when the basic draft of Article 370 underwent a change within three days of its agreed content, Article 370 has never changed. It is its abuse that diluted the autonomy. Since 1950, President of India has issued as many as 46 Constitution (Amendment) orders and all of them, on the face of it, were done in consultation with the J&K government. Efforts to trace any record that will shed light on the mechanism in Srinagar to suggest such promulgations failed. There are instances, however, in which India’s constitutional amendments were harmonized to suit J&K exclusivity in Indian federation. Normally, various officers said, the cabinet would take a call and on those recommendations the Rashtrapati Bhawan would issue the order. The incumbent government followed the same course. It discussed the GST related issue with the central government, took it to the cabinet and approved it. Now the only requirement is to convey consent and the Presidential order will be issued. 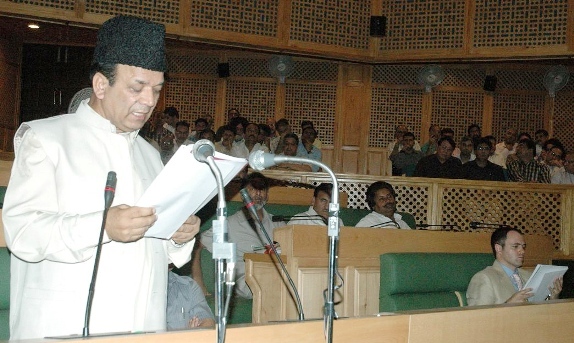 Finance minister Abdul Abdul Rahim Rather presenting 2009-10 budget in state assembly. But this time, some people in the government wanted to use GST to attempt empowering the state assembly. In J&K’s entire post-partition history, assembly never discussed consent of the state or draft of a recommendation to the President for issuing a constitutional amendment order. A beleaguered government, dented by pellet-power, wanted to create precedence, a historic one, in which the peoples’ representatives would discuss and eventually draft the details of the order that the President would issue. This unprecedented initiative would by default empower the state assembly that has been dis-empowered by successive regimes. Strangely however, once the decision was taken, GST moved to the street and not to the assembly. Chief Minister met the trade and said there will be no compromise on autonomy. Next day, trade met Finance Minister and felt almost convinced that things were on the right track. By then, an All Party Meeting (APM) was announced. The opposition asked if the government had decided things in cabinet, why was the APM required? When Drabu made his presentation, the opposition asked him about the best of the three options he mentioned in his PPT. When he suggested one, pat came the reply: you have already made your mind, why involve us? 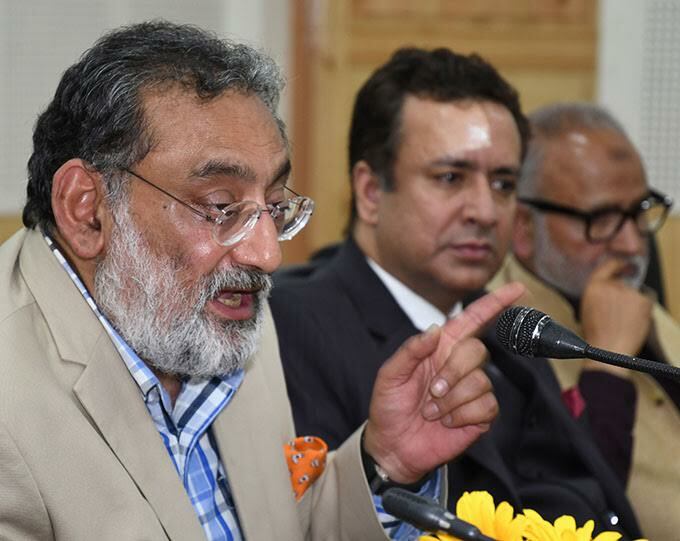 There were three former finance ministers – Mohammad Shafi Urvi, Abdul Rahim Rather and Muzaffar Hussain Beig, the finance minister hopeful Devinder Singh Rana and the incumbent one, Drabu present in the meeting. Beig emerged as moderator doing a balancing act in articulating the finer issues of trade and the law. But the politicking spoiled the broth. The real game-changer was the intervention of Ghulam Hassan Mir and Hakim Yasin who said the 2008 agitation was just a matter of 32 kanals of land which, in comparison, to GST was nothing. A scare took over the weak government. As the voices of discord moved to newspaper front-pages, trade was back – this time with a day long strike call, coinciding with the day one of the proposed special short session of assembly. The 4-day session will now start with obituary references and then adjourn. With assembly locked, the GST will now go to a Working Group with Beig as chairman and all the parties having a member each in it. Its recommendations will go to the assembly that will resume then! As the discord became public, BJP government in Delhi already started asserting. Indications suggest that it might back out from some of the “concessions” it had agreed upon earlier in helping J&K sustain its exclusivity. GST will eventually come to J&K. But the fuss created over it suggests that the ‘deep state’ is unwilling to permit J&K regain part of the empowerment that its assembly once had. In the turf war, why should NC permit PDP create a precedence that would judge politics retrospectively? It suits Delhi to make extension of new processes and procedures to J&K a hush-hush affair, as it used to be. But it wants J&K to retain its exclusivity in doing things at Delhi’s behest. Change of nomenclature in state hierarchy to governor and chief minister was done by state lawmakers and not by any presidential proclamation! Next Article The Missing Mudasir?